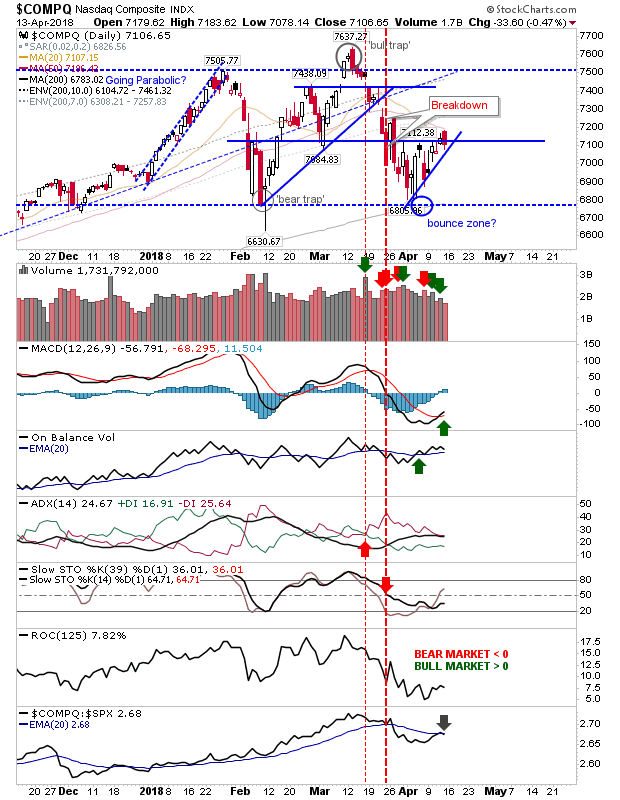 Markets had started Friday above the marked consolidations I had drawn on the charts but subsequently ended the week still inside these trading ranges. 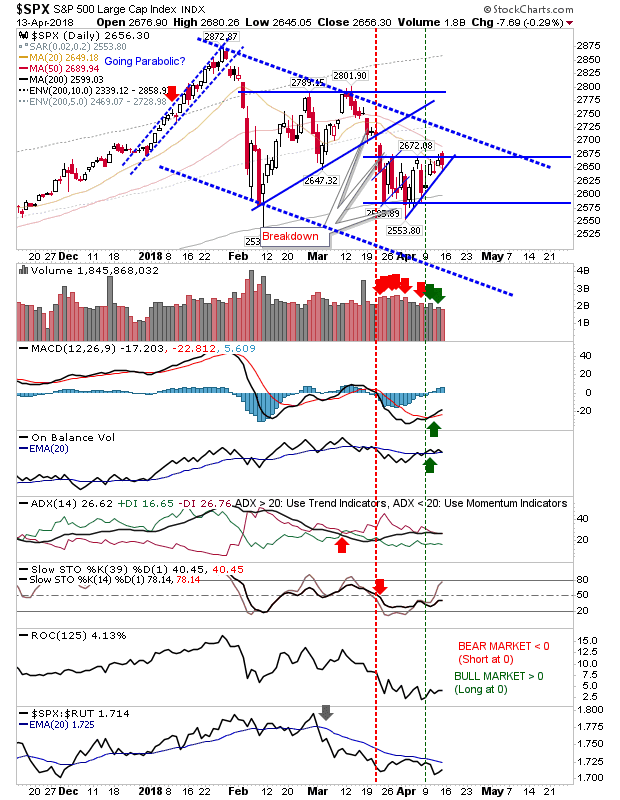 As a two-day pattern, Friday’s close finished as a bearish engulfing pattern across markets which means I’ll be looking for a break of newly drawn ascending support (of the last 8 days) in these indices. The S&P still has a MACD and On-Balance-Volume trigger ‘buy’ signals but Friday’s high (and the high of the bearish engulfing pattern) was the 50-day MA. Sidelined bulls will want to see a convincing break of the 50-day MA, and probably the downward channel before committing. Bears have the easier play – helped by the strong relative underperformance of the index against its peers. Short the loss of Friday’s low with a stop above 2,680. 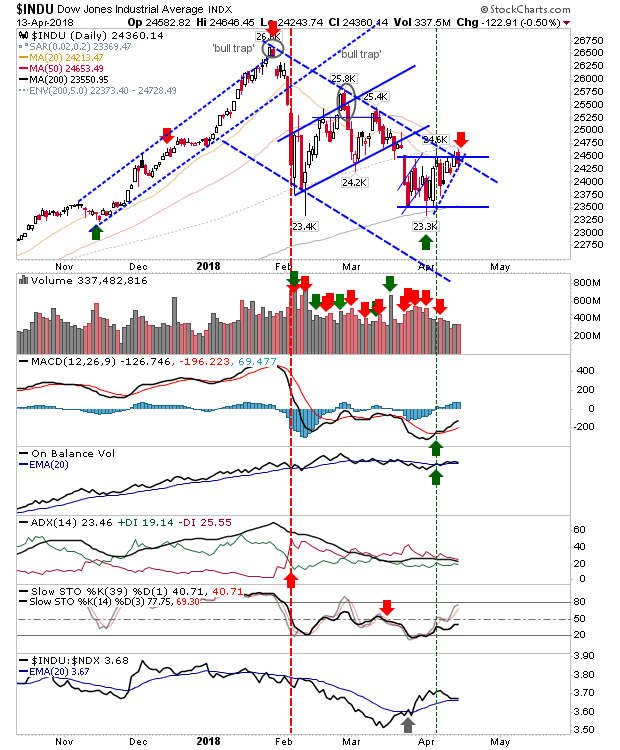 The Nasdaq is in a similar position to the S&P; Friday’s reversal came away from converged 20-day and 50-day MAs with a similar technical picture. The same short play opportunity is on offer: sell loss of 7,708 with a stop above 7,185. The Russell 2000 actually managed to clear its consolidation, its 20-day and 50-day MAs. Unlike other indices, there was no drop back inside the consolidation. In addition, relative performance continued to improve. 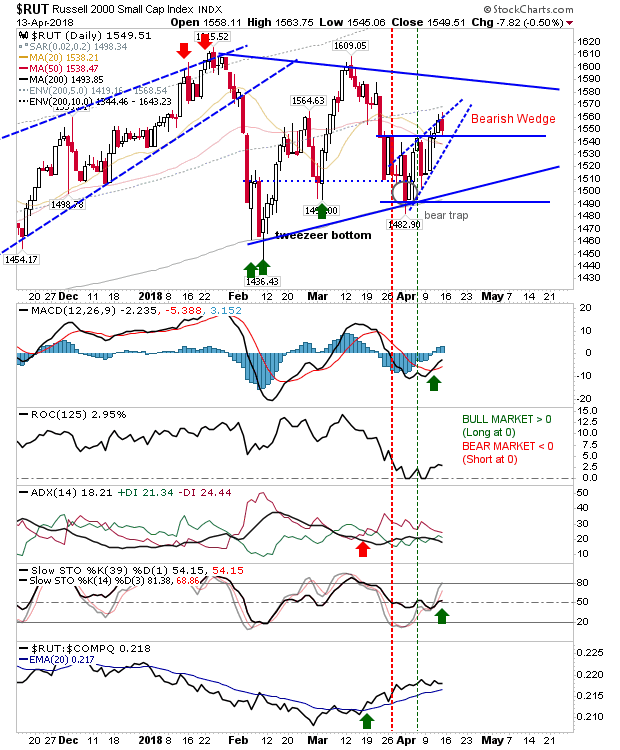 All this suggests a bullish outlook but I have also drawn in a possible ‘bearish wedge’ too. As for other indices, the Dow Jones Index reversed from channel resistance in what is a good shorting opportunity. Risk is measured on a break above 24,650 with a target of the lower channel. For Monday, look for a break of Friday’s lows. A weak open will present a shorting opportunity which could last a few days – if not a few weeks. Decisive moves above 20-day/50-day MAs on volume will negate the short play.